Buried pipes with holes facing the roots. Works best with small shrubs, vines and perennials. Keep the bottom plugged for shallow-rooted plants and open for deep-rooted. If using bamboo, cure first to prevent cracking. CONS: Harder to install if plant is already in place. Bamboo may crack (wire or tape prior to use). Perforated pipes can be made from clay, concrete, PVC, and bamboo or any material that will seal well so roots don’t grow inside. We chose to use bamboo for pipes because it was free. 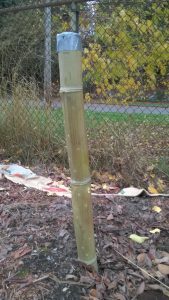 Some bamboo was was three inches in diameter and that size allowed our pipes to hold 1/2 gallon of water. Because bamboo can split, we are keeping a watchful eye and are still learning how best to cure it. We will know more by the time we next install pipes, which will be in the winter when the ground is soft. Holes are drilled in the bamboo pipe on the side facing the roots of the shrub. 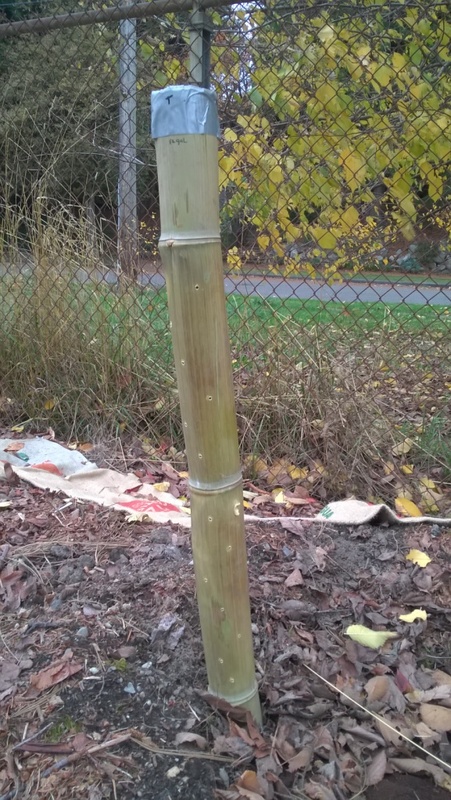 When using bamboo, you drill holes through the nodes but you can keep the bottom node intact in case your roots are shorter and you want to focus water to just the depth of the pipe. You can always burn out the bottom node later if the plant roots grow below the bottom of the pipe. We used pipe on five blueberry bushes. We used a post hole digger to bury most of the pipe and then added a screen on the top to keep debris out. 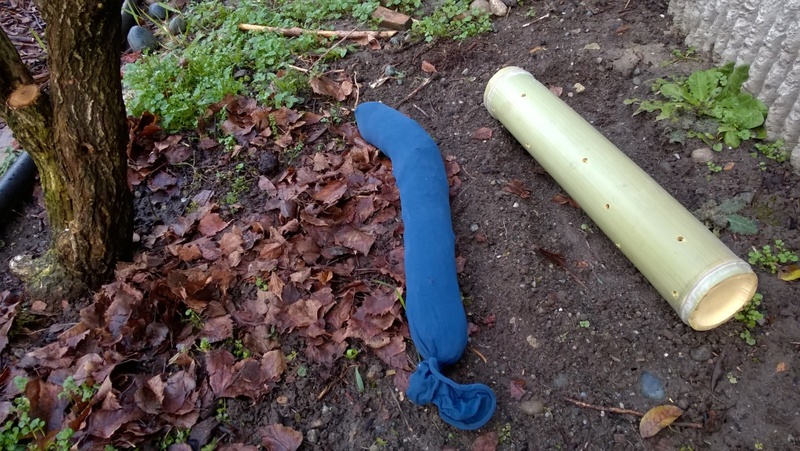 Three of the bamboo pipes we used were added after the plant was already in place. Two were planted prior to adding new bushes in the winter of 2017/2018. The results were less than stellar but there were many factors. The blueberry plants in this north section of the orchard have not been growing or producing berries well so last fall we pulled them up, created large craters for them to sit in, fed the holes with organic matter and put the bushes back in the same place. The main reason why the bushes were not productive might have been that we were not checking the soil for moisture content early in the season. The plants are all alive so we will try to keep a better eye in this area in the future. 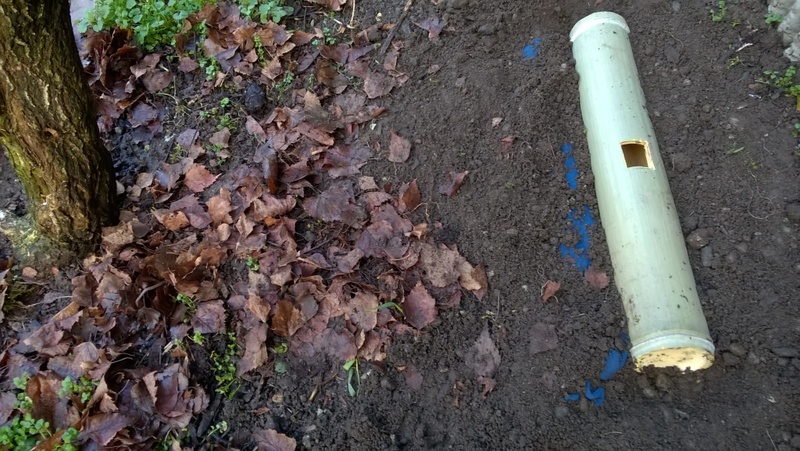 We do like the idea of the pipe because it takes very little space and you can really target the roots. I think it’s best to have the pipe in place prior to planting so the new plant roots can respond to their environment early. We are now experimenting with some horizontal bamboo perforated pipe. This bed is sloped. To slow the water flow to the roots of the elderberry, there is a sock filled with compost just below the pipe.